The libraries have been built by successive generations of Irish Redemptorists, dating from the first Redemptorist house in Limerick in the mid-19th century. Books date from the mid-1500s to the present day, and are a testament to the scholarly interests of the Congregation in Ireland. There are 4 main collections: Redemptorist Collection, Pre 1900 Collection, Irish Studies Collection and Moral Theology Collection. In addition to these specialisations, there are books on all areas of religious life including theology, spirituality, bible studies, and Christian church history, as well as general collections of literature, history, geography and social science. The libraries are intended to offer a valuable resource for members of the Province and for those engaged in studying the Redemptorist order and related topics. Redemptorist Collection: A multilingual collection of published works by or about the order, with a particular focus on Irish Redemptorists. Pre 1900 Collection: Books dating from the mid-1500s to the late 1800s covering a variety of religious and cultural topics. Irish Studies Collection: Books about Irish history, literature, culture, religion and geography, as well as extensive collections of Irish language publications dating from the 18th to the 20th century. Moral Theology Collection: A collection relevant to the teachings of the Redemptorist founder, St Alphonsus de Liguori, dating from the 18th century. Marianella Dublin, 1932. [Front row centre, Ukrainian Redemptorist Bishop Nicholas Charnetskyj, who was visiting Ireland for the 1932 Eucharistic Congress. Nicholas Charnetskyj was beatified by Pope John Paul II during his visit to the Ukraine in 2001]. The archives contain the records of the Redemptorists in Ireland from 1851 onwards. The archives contain papers relating to Redemptorist Province administration, individual Redemptorists, Province communities, missions and retreats, and records of the Vice-Provinces. Each community holds its own archival collection, in addition to the Province Archives. Archival holdings include house chronicles, confraternity registers, photograph albums, tape recordings and artefacts. Please contact archives@redemptorists.ie with any queries. LIBRARIES: A project is currently underway to create an online catalogue of Redemptorist libraries and to rationalise holdings through a systematic deselection process. ARCHIVES: Accessioning and listing of the archives are ongoing. 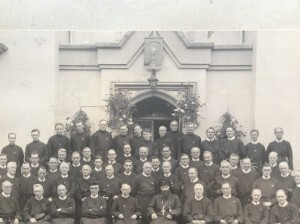 Please see the Irish Redemptorist Archives Flickr account for photographs from the archives. For project updates from both the library & archive please see the library facebook page.